Maple Ridge – Pitt Meadows School District No. 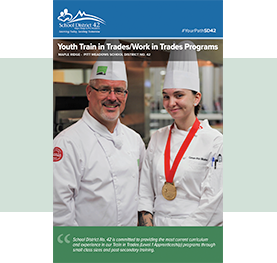 42 has teamed up with several post secondary institutions and trades training organizations to offer apprenticeship training programs for Grade 10, 11 and 12 students and adult learners. Students going into Grade 12 now have the option to graduate as well as earning first-year, post-secondary certification and apprenticeship training in one year with no tuition fees. Students who are interested in these programs can contact Steve Wiebe at 604.318.9792 (email: steven_wiebe@sd42.ca) or Brad Dingler at 604.626.1176 (email: brad_dingler@sd42.ca). You can also see your counselor, work experience coordinator or career planning assistant at your school. Visit the Trades and Partnerships Programs website. Refrigeration mechanics make, install, repair and service residential, commercial and industrial cooling and heating systems. If you are age 19 or over you will require a Criminal Record Check which must be attached to your application. You get this done at the Ridge Meadows Police Station at a cost of $55. It may take more than a few days to have your check completed. Students must be enrolled in a course of study that will lead to Grade 12 graduation upon completion of high school. Can adults and graduated students apply? Adults and graduated student may also apply to any of the programs the district offers, subject to available space. Can I register in a program that is not located at my home school? A student can register in an academy or partnership program at a school other than their home school. They can “cross enrol” (be enrolled at both schools) and graduate from their home school. Does the district offer a bus service for cross enrolled students? This service is no longer offered. Students are responsible for finding their own way (via public transit or private vehicle) to and from their home school to their partnership school. Can I get help completing my application package? Ask the work experience coordinator, career planning assistant, or your school counselor for assistance in completing your application package.